Most of the following information is taken from Dave Pastrick's article in the Oldsmobile Club of America newsletter...the rest from personal research in parts manuals, technical bulletins and parts catalogs. This page is fairly graphic intensive. To allow the greatest amount of detail to be shown in the pictures on this page, I've opted to keep the images' physical size fairly large. Please be patient while the page downloads. Many people have asked how to identify Oldsmobile's Super Stock wheels, what the differences between SSI, SSII and SSIII are, what size were they, etc. Hopefully this page will help in that endeavor. NOTE: This page only contains information on wheels up through 1975. The SSII and SSIII wheels were identical, except that the SSII's were painted silver and the SSIII's were painted the lower body color. All Super Stock wheels used chrome acorn-style nuts with a 7/16"-20 RH thread. 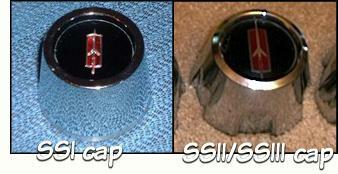 The pictures below show the difference between the two styles of Super Stock wheels. The numbers across the top of the table below indicate the correct Super Stock wheel option for the year listed on the left side. Each wheel is numbered and described below. 1966 X . . . . . . . . . . . . .
1967 X . . . . . . . . . . . . .
1968 X . . X . . . . . . . . . .
1969 X . . . X . . . . X . . . .
1970 X X X . X X . . . . . . . .
1971 . X . . X X . . . . X . . .
1972 . X . . . X . . . . X . . .
1973 . . . . . . X . . . . X . .
1974 . . . . . . X X . . . X X . 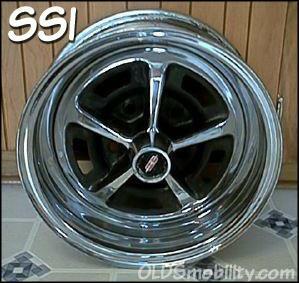 '71-only 14" x 7" SSI wheel - all chrome, no trim ring. Earlier '66-'69 versions were similar in appearance but were only available in 14" x 6" widths and do not fit disc-brake models. introduced in 1970 and available through 1972. These are generally referred to as '1971 1st type'. Introduced in 1966 and available through 1970 under option code PO5. The spokes and rim were chrome, with the area between the spokes painted semi-gloss black. The wheel is stamped by the number 795C on the inside of the rim. These do not fit disc-brake models. However, there was a rare 14" x 6" wheel option for '69 models with disc brakes which have a different offset to accomodate the brakes. A larger 14" x 7" size was introduced in 1970 and was available through 1972 and did fit disc-brake models. This wheel was slightly different in appearance because the chrome spokes were accented by the area between the spokes painted black and the outer rim was painted gray or black and incorporated a polished trim ring. The center cap remained the same. Four versions were produced, if you count the ultra-rare '69 14" x 6". NOTE: The '66-'70 SSI wheels will not clear disc brakes from any year. The problem is that the rim of the wheel is shaped differently. If you look at the backside of an SSI, you will see that the rim drops towards the center of the wheel within an inch of the edge. On rims designed to clear disc brake calipers this surface will be inset about two inches from the inboard edge before it drops towards the center. All SSII/III rims of any year (including the '68-'69 14x6 SSII rims) will clear all factory disc brakes, as they have the recessed "drop" feature. 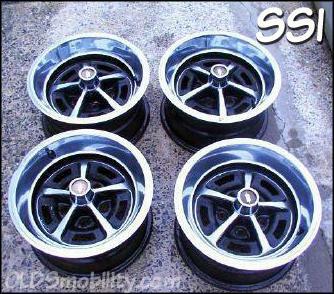 The later 14x7 SSI rims will also clear discs. The factory steel rims for disc brake cars have the feature described above. After about 1970, as disc brakes became more common, all cars were fitted with the rims that clear (even drum brake cars). Introduced in 1968 as option code N66. This wheel is painted gray with the area around the 5 center holes painted a brighter shade of silver, and trimmed with chrome bezels. The original factory part number 400422 was available through 1969, although 1969 models were painted dark gray. Available only in a 14" x 6" size, it used a brushed finish trim ring. 1969 Hurst/Olds models also featured this wheel in a special 15" x 7" size with a chrome rim (no trim ring), and were painted the same color as other Super Stock II wheels. 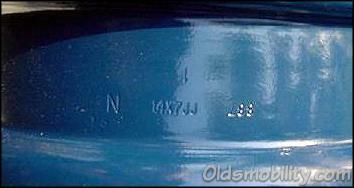 The special Hurst/Olds wheels can be identified by the factory number 890 and the size 15 x 7 JJ stamped into the rim. 1970-1972 models used a 14" x 7" size (original part # 406069) and used a special trim ring. The wheels remained painted the same as the 1969 trim. 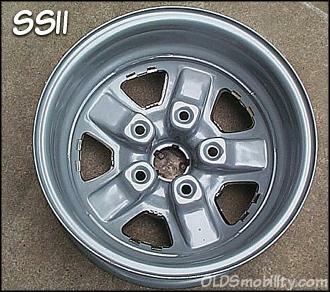 The SSIII wheel is very similar to the Super Stock II wheel, and in fact used the same 14" x 7" wheel (original part #406069) but is painted the lower body color instead of the standard dark gray. Center caps, chrome bezels, lug nuts, and trim rings are all the same as the 1970-72 Super Stock II wheel. The SSIII wheel first was available in 1971 as option code N67 and continued through 1972. SSI - Introduced in 1966 as option code PO5; size 14" x 6"; PN was 393822 in '66-'67 parts book and #405941 in June 1978 parts book (don't know when the number was changed); five spokes, all chrome with area between spokes painted flat black; uses hub ornament with a black center insert with a rod rocket outlined in silver, held in place by a retainer and machine screws; you can identify this wheel by the number 795C and size 14 x 6JK stamped somewhere on the inside rim area. This wheel will not fit disc brake models. SSI - Introduced in 1970 as option code PO5; size 14" x 7"; PN 406070; referred to as 1971 1st type (2nd type was #3 below); five spoke chrome center with area between spokes painted flat black and the rim painted gray or black; hub ornament with retainer and machine screws. This wheel will fit disc brake models. Stamped with 818 inside rim. SSI - Introduced in 1971 as option code PO5; size 14" x 7"; PN 411210; referred to as 1971 2nd type (1st type was #2 above); five spokes, all chrome including rim with area between spokes painted flat black; uses hub ornament held in place by a retainer and machine screws. On the right is the '68 442/HO SSII wheel (next to a regular '69-'72 SSII for visual comparison.) You can clearly see the difference in the width of the trim ring. A regular '69-'72 is 14" x 7" - the '68 442/HO SSII is 14" x 6". Also, the '68 442/HO SSII rims don't use the 5 chrome bezels per rim...instead, the factory painted these a brighter shade of silver. These were only available on 1968 442/HurstOlds and used a tiny trim ring about 1 1/2" wide. SSII - Introduced in 1969 as option code N66; size 14" x 6"; PN 400422; whole wheel is painted gray; uses five chrome bezels around the center holes; uses hub ornament held in place with machine screws; uses 14" trim ring. Stamped with 793 inside rim. SSII - Introduced in 1970 as option code N66; size 14" x 7"; PN406069; whole wheel is gray argent; uses five chrome bezels around the center holes; uses hub ornament held in place with machine screws; uses 14" trim ring. Stamped with 819 inside rim. SSII - Introduced in 1973 as option code N66; size 14" x 7"; PN 409937; whole wheel is painted gray; uses five chrome bezels around the center holes; uses hub ornament held in place with machine screws; uses 14" trim ring. SSII - Introduced in 1974 as option code N71; size 15" x 7"; PN 417796; whole wheel is painted gray; uses five chrome bezels around the center holes; uses hub ornament held in place with machine screws; uses 15" trim ring. SSII - Introduced in 1975 as option code N71; size 15" x 7"; PN 416614; whole wheel is painted gray; uses five chrome bezels around the center holes; uses snap-on hub ornament package; uses 15" trim ring. SSII - These wheels were standard equipment on the 1969 Hurst/Olds; they had a chrome rim with the center hub painted gray; uses hub ornament held in place with machine bolts; you can identify this wheel by the number 890 and the size 15 x 7JJ stamped into the metal somewhere on the rims. SSIII - Introduced in 1971 as option code N67; size 14" x 7"; exactly the same as number 6 above except that it is painted the lower body color. SSIII - Introduced in 1973 as option code N67; size 14" x 7"; exactly the same as number 7 above except that it is painted the lower body color. SSIII - Introduced in 1973 as option code N67; size 15" x 7"; exactly the same as number 8 above except that it is painted the lower body color. SSIII - Introduced in 1975 as option code N72; size 15" x 7"; exactly the same as number 9 above except that it is painted the lower body color. If you're poking around a salvage yard or a flea market looking for wheels, here are a few tips that may help you. The wheel size is stamped into the area between the rims, along with an identification number. When you measure a wheel for width, measure from the inside of the back rim to the inside of the front rim. If you measure from outside to outside, it will be an inch larger. Thus, a 14" x 6" wheel will measure 7 inches from outside to outside. Use measuring only as a last resort. If the wheel is too rusty or deteriorated to the point where you can't read the information that is stamped into the area between the rims, it probably isn't worth buying. The SSI's look like Magnum 500 wheels used by Ford, Chrysler, and AMC, so if you can't read the numbers, be sure you match the bolt pattern to a GM axle. 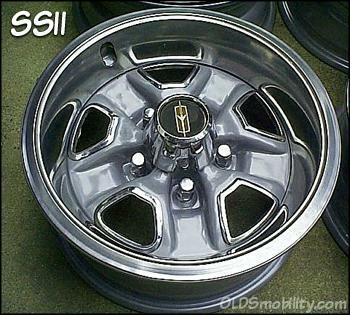 The SSII and SSIII wheels were identical, except that the SSII's were painted silver, and the SSIII's were painted the lower body color. 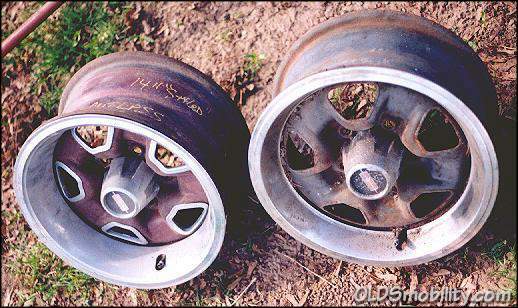 All of the SSII and SSIII wheels were unique to Oldsmobile and will fit on any A-body axle, with or without disc brakes. They are easily identified by sight, but if you want the correct wheel for your particular application, check the information stamped into the wheel. Note: 685 fits if proper size. 775 14 x 6, 6-4 ¾ Disc brake, stamped steel - P/N 9791450 - stamped HB or HF near valvestem hole. - Buick Special '68 w/disc brakes exc Rally wheel. - Buick Special '69 std duty exc Mag wheel. - Buick Special '70 std duty exc Mag wheel or space-saver wheel. - Grand Prix '69 exc Rally wheel or space-saver spare. - Olds F-85 '67-68 disc brake exc chrome Super Stock wheels. 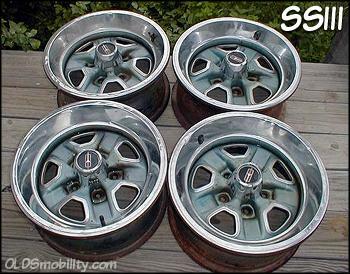 - Olds F-85 '70 exc SW or Super Stock wheels. - Tempest '67 exc Rally wheel or space-saver spare. - Tempest '68-69 exc Rally wheel or space-saver spare. 813 14 x 7, 5-4 ¾ stamped steel - P/N 3966936, 9798480. Note: Firebird & Grand Prix stamped IF. - '69 Camaro exc Rally or mag wheel. - '69-70Chevy II exc Rally or mag wheel. - '69-70 Firebird exc Rally wheel. - '69-70 Grand Prix exc Rally Wheel. - '70 Olds F-85 exc Super Stock wheels. (yes, that's right!....a 5 ½" SSI wheel! Want to link to this site? Please use this banner. For questions, comments or suggestions, please e-mail me. All content on this site is © 1999-2008 by OLDSmobility.com/Project 442 Clone, unless otherwise noted. All rights reserved. This page last modified on April 05, 2008.